The above photo shows Aselsan’s naval version of Korkut air defence gun system. The below photo shows the grounded vessel Alcatras and her cargo. A is the 3D search radar. The shape of the radar and the neck of the mast is very distinct. B is the fire control radar on the turret. Though the turret is covered on the boat, the shape and the height is consistent with the uncovered turret. The arrow shows the direction of the barrels. The photo above is from Twitter user @TyrannosurusRex. The photo below is from The Toc. I don’t know what to say. Should I call it a Greek tragedy or a Turkish comedy? A brand-new prototype of locally developed naval air defence system ended up, grounded on a Greek Island. The whole episode started like many others. 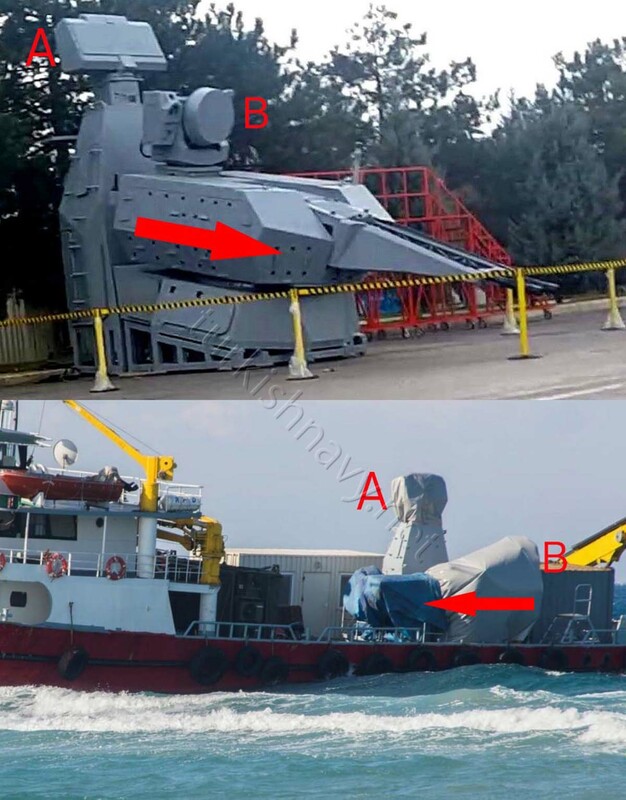 The Turkish flagged M/V Alcatras experienced a rudder failure as she was sailing from Tuzla, Istanbul to Antalya, according to the captain’s statement. Being unable to steer she run aground on Kos island at approximately 100 m from the beach of Lambi. Such incidents do happen in the Aegean Sea quite often. M/V Alcatras is a 28 meters long vessels. She bears all the characteristics of a large Turkish fishing vessel designed to work on the seas around Turkey. But she is has no fishing gear installed. She is registered as a diving tender. The old photos of the vessel in Marine Traffic shows a typical working boat, with the superstructure in front and a large working area at aft. When M/V Alcatras was grounded in Kos however she was loaded with what appears as two white containers for accommodation or for working and one green container. Furthermore she has one medium hight mast with a covered top and another structure also totally covered. This is the valuable cargo. The mast and the covered cargo have the distinct shape of the naval air defence gun system developed by Aselsan. Aselsan has developed for Turkish Army a self propelled air defense gun system called Korkut. One Korkut unit consists one command and control vehicle with a 3D search radar (marked A on the photo above) and 3 gun vehicles, each fitted with a twin 35mm air defence gun and a fire control radar. The twin guns are Oerlikon GDF-002 units produced under licence by MKEK. The development of Korkut has recently reached the field testing phase and some vehicles were delivered to Turkish Army for this purpose. The naval Korkut was loaded on M/V Alcatras in Istanbul and she was heading to Antalya. There are no naval construction facilities in Antalya. M/V Alcatras was not merely transporting the system from Tuzla to Antalya. It is safe to assume once in Antalya, the vessel was to conduct tests on the open sea. Hence there are containers on board too. The location of the turret proivdes a wide arc of fire from the side. There were rumors that a navalised air defence gun system based on Korkut was also on development but there was no concrete evidence. First the photo of the prototype was published on Twitter. Later the news about the grounding of a Turkish vessel with a mysterious cargo was published. Now, we and our neighbours know that we have developed a prototype of such a system. The Greek website OnAlert reported that the cargo of M/V Alcatras was transferred to another vessel to lighten up the around ship. Since there is no official statements about the incident, there is a (though small) possibility that my story may turn out to be wrong. And I would like to thank Alper Böler for his carefull observation. THIS A NEW AIR DEFENSE SYSTEM TO THE TURKISH AIR FORCE IN THE NEAR LOCATION OF GREEK ISLAND. Not 24, but a couple hours before me for sure.